How to develop critical thinking in your child? If your thinking is somewhat confusing, vague and kind of fuzzy, it would definitely not lead to a prudent and sensible outcome. The mind that you have is everything. You become what you think. This is a famous line from Gautama Buddha. Having said that, let me tell you that every child is unique and they have their own vision to see things around and understand them. We as parents need to make sure that their cognitive skills are developed properly so that they could take correct decisions in life. Thinking skill is something that is always taken for granted. People use it quite often without giving its due. Like, ‘Okay I think I would do this’. The question is, how well can you think? Only when you know how to use your mind properly you can teach your child to develop critical thinking. Always make sure to make your child understand things grounded in reality. Being a dreamer is okay to develop imaginative capability, however, to develop critical thinking one has to start understanding things objectively. How should we start thinking objectively? Well, subjective thinking is something easy to grasp and follow as it comes out naturally to us. The difficult task is to start thinking objectively as it is a skill that needs to be acquired. Thinking is a cognitive skill, a kind of mental activity that involves problem-solving, planning for action, strategies and so on. It is also purposive otherwise it becomes daydreaming and fantasy. Objective thinking means developing an understanding based on facts and data. It is opposed to wishful thinking. It is free from being biased and judgemental having preconceived ideas and standpoints. When we are able to take a back step and understand matters critically without jumping to conclusions we can be successful in thinking objectively. 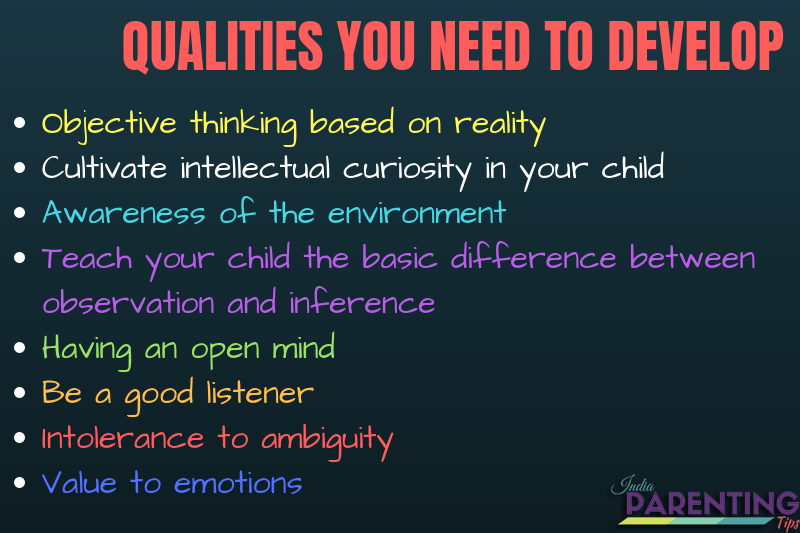 How to develop objective thinking in your child? It is super easy to develop objective thinking in your child than in adults like you and me. The reason is that children are not biased. They do not mind taking risks and are always inquisitive to learn something new. Teach your child to think objectively by play way methods. Allow ample time to him and her to explore and learn things by themselves without worrying too much or intervening. This would help him or her to develop independent thinking which is an important part of the personality development of a child. Always ask open-ended questions beginning with what, when, how and so on. When you give him an activity to play so not immediately expect a result then and there. Let the child explore things and learn it in his or her own way. Example, you give a fire truck to the child. Let the child see what it is and understand how it looks like first. Give some time for him or her to explore. Then you may start asking open-ended questions like what do you think this vehicle is? Show another vehicle. Maybe a normal truck or a dump truck and ask him if he or she can spot the difference. This way you are helping the child to learn thinking critically. One can develop critical thinking only when one is able to understand and appreciate the environment where he or she lives in. Ensure that your child is aware of his or her environment, of the things around him or her. When I say awareness of the environment I mean to be conscious of the present moment and not being an environmentalist. When you are aware of the present moment, your environment that you live in, it brings a lot of peace, sanity, and clear understanding. An example you can show a picture of a room full of books and a child reading a book and ask your child what he or she can observe and see. Obviously, the child will say that it is a picture of a boy or a girl reading a book. Now you ask another question. Where do you think the child is sitting? Let your child derive the conclusion as a library. Now that conclusion is the inference and it is based on objective study and understanding. It is important to teach your child that inference is not a prediction. Predicting something is forecasting it and although both are often related, they are also different from one another. Understanding observation and drawing inferences begin with the basic understanding of being aware of what you see around, what you can smell, what you can hear and so on. Teach your child to understand and appreciate things around. This would pave way for learning the skills to meditate and concentrate. The next important thing that you need to teach your child is to have an open mind. The child learns from your actions and not from your words. Ensure that you show by your actions that you have an open mind to think as opposed to being biased and judgemental. To develop open-mindedness in your child, you need to give him ample space to think and express his ideas and visions without hovering around him like a helicopter monitoring his moves and actions all the time. Check my article on helicopter parenting for more details. Another important way to develop open-minded thoughts in your child is to make sure he or she gets ample space to express his opinion freely without getting scared or challenged to speak out. Always appreciate his or her point of view even if you disagree. Do not stop him or her to express his or her will. In order to develop sound critical thinking in your child, you must ensure first not to be judgemental and quickly jump to conclusions. Allow your child to express his or her views when he or she talks. Remove any kind of distractions that you think can hinder your child when he or she tries to express himself or herself. Practice silence while listening and try not to interrupt in between. Keep a good eye contact when your child speaks even if you have too many things in your head to think of. Show interest and appreciate his or her point of view. Lastly but not the least keep a watch for his or her non-verbal communication and voice tone. While I agree that everything cannot be divided into black and white, right and wrong, the shades of grey are often the culprit of big confusions and ambiguity. When you try to clear the disclarity, you get more visions to clear ideas that help to think critically. The minute blurriness that we often feel lazy to clear off often comes to be a big hindrance to critical thinking and logical understandings. Ensure that you clear off every doubt and obscurity that blocks objective thinking for your child. This is possible with open communication, exposure to a child, life skill activities, and a nurturing environment for the child to grow and flourish blissfully. ‘No question is a stupid question.’ This was a famous line of my college lecturer that I always remember and belief. A person without good emotional content is hollow and mechanical like a machine. We must have emotional intelligence in order to develop critical thinking. What is emotional intelligence? I have discussed in depth about this topic in my article. Please go through the entire content to have a clear understanding of having emotional value. There are many ways in which emotional value and intelligence help to make critical decisions effective. If you read my article on Emotional Intelligence you would get more clarity on this. When I say strong emotional value I mean strong value in understanding one’s own emotions. I do not mean being emotionally charged up all the time while making decisions. That is the opposite of thinking critically. When you have control over your thoughts and you are aware of your feelings (you are able to answer ‘what’ and ‘why’ questions), you are able to make more sound decisions. It helps you to make rational decisions because when one has no control over emotions one often makes wrong decisions out of stress. How can you teach your child to be self-aware? I have dedicated a whole article on emotional intelligence and how to help your child to develop emotional intelligence. I would suggest you go through the entire content for complete understanding. 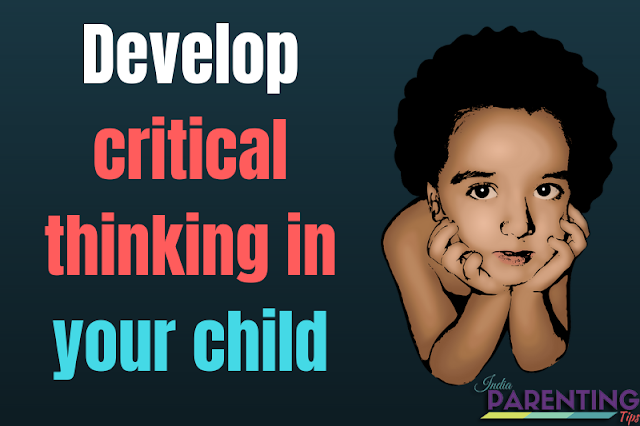 I hope, I was able to pour out some thoughts and lights on how to develop critical thinking in your child. I always welcome different opinions and thoughts. If you have any more ideas, I would request you to kindly write to me a comment and share your valuable information which might help all of us to learn and grow together as one parenting community.